I was around 14 years old when I visited Bali for the second time. The first time I went to the tropical island was a year before the second one on a school field trip. Days were well spent and the trip produced pleasant memories to be dearly reminisced, so when I was informed that the whole family, including families from my mother’s side, were planning a big family vacation to Bali, I was simply ecstatic. I looked forward to exploring more of the island with my cousins, whom I was deeply fond of. It was in August, the perfect time for the families to gather as the children were having school holidays. The night before the flight always had to be the most chaotic, and at times, fun experience. Picking outfits which took longer than half an hour, gathering all the valuable documents, buying snacks and drinks, and stuffing all of them into the suitcase could be exhausting yet exhilarating at the same time. I remember laying all my favorite dresses on the bed just before helping Mom zipping up her suitcase. Time passed insanely slow when we anticipated for tomorrow, so I slept and drifted into dreamland. The next day we boarded the plane in the afternoon. Looking back, it surprised me how nonchalant I was having to travel by plane. I can barely get to the airport without sweating out of anxiety now, but back then, I was pretty composed and even seemed to mildly enjoy flying. I sat in the middle as my two older cousins, Hanna and Cindy, sat on my sides. I wore a blue striped sundress which reached down until my knee, and my look was perfected with a pair of sunglasses to give off the traveling vibe. During the short flight, we didn’t do much except for taking a few pictures and talking about what we’d do once the plane touch the ground. Maybe it was the atmosphere of vacation, maybe it was the realization that you were about to actualize the scenarios you had created in mind about your ideal vacation, or maybe it was both. For as soon as the plane came to a halt in the runway, I couldn’t contain my excitement to immediately exit the large vehicle and officially ‘begin’ the trip. My head immediately thought of the beach, as the last time I was in Bali I could only play around in the beach for less than an hour. So this time, with my cousins, I was determined to have fun under the sun for as long as I please. Bali, in my opinion, was enchantingly beautiful. This indeed seems like an overstatement, but having only been living in Jakarta, the polluted, everyday-traffic-jams city all my life, the natural scenery gave a refreshing image, a breath of fresh air compared to skyscrapers and lined up malls I usually pass through. It might also due to the fact that Bali is highly romanticized, the island has always been portrayed as magical, abundant in beauty and evoking sublime feelings. After collecting our luggage, we soon drove to the hotel by the car my uncle had rented for the trip. 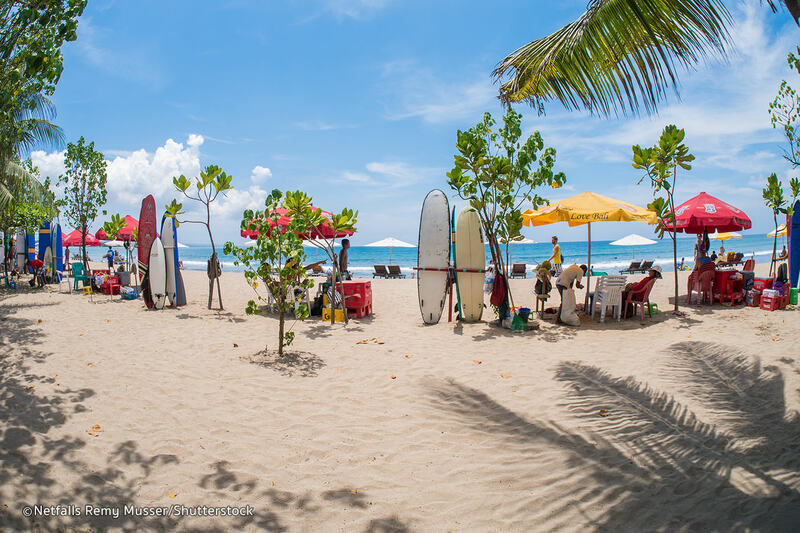 Kuta, the mainstream, over-visited, resort town, became our choice to stay at. I had no problem staying in Kuta, or anywhere in particular since it was the adults who had to pay the bills anyway. So in Kuta, the story of adventurous and mischievous young adults took place. That night of our first day in Bali, the young kids went out in secret to have fun by ourselves as suggested by Aldy. Our room was located at the end of the hall, and we had to be careful not to get caught trying to pass the parents’ room and reach the lobby. I felt like smuggling some kind of prohibited items by the way we were walking so carefully and not so gracefully. I tried holding up my laugh seeing how nervous we all looked, but my heart was pounding both of fear and excitement. It didn’t take long, for we soon were outside the gate of the hotel. We were welcomed by the night view, which was simply gorgeous. Little shops and stalls were lit with colorful lamps, music was blasting from a café, the wind blew just enough to soothe your troubled mind, and the world seemed to be ours. We came to eat at a stall that served fried chicken not too far away from the hotel, and Aldy, being the oldest, offered to pay for the dinner. It felt oddly refreshing, unfamiliar yet satisfying. The moon seemed to be just above the roof, the leaves twirled around as if they were dancing. Both foreigners and locals gathered in Kuta, everyone was enjoying the beauty and hospitality of the paradise island. Being outside by our own made me feel like an adult for the night, there was no one to order us here and there and it was just a whole new experience. I was dying to go to the beach on our first day, but it was late and there wasn’t much to see under the dark. So then, we made a promise to go to the beach at least once before taking a flight back to Jakarta. Our visit to the beach didn’t happen until the last day as we mostly visited cultural heritages. Mom wouldn’t let us go because it was close to boarding time. It wasn’t though, the flight was scheduled to take off in the evening while it was still in the morning. “It’d be troublesome,” she said, “you’d lose track of time and we might be late.” I tried convincing her I wouldn’t, we wouldn’t, and it seemed like the debate wouldn’t come to an end anytime soon. 14-year-old me was a lot to handle, I sulked and made a scene which seemed to drain Mom’s energy in an instant. She eventually let us go, but denied to come along as she’d preferred to relax before coming back home. I quickly unzipped my suitcase to find my swimsuit nowhere inside. I was panicked for a split second, as I could’ve swore I’d put it inside. My cousin Hanna, who noticed my slight distress, suggested me to just wear what I was wearing to the beach, a red shirt with shorts. “It wouldn’t be embarrassing, in fact, I’d just wear a shirt and shorts too.” she convinced me. Her words brought me comfort and without further ado, we headed to the beach. As if experiencing a déjà vu, this time we were only by ourselves again. Ten minutes was all it took by walk to arrive at Kuta beach. We didn’t waste any time and immediately get into the water and have fun. It was the typical splashing water at each other, racing to be the fastest to reach a point types of game. The waves kept hitting us and Cindy had an idea that we jump together just before another wave hit us. It was quite an idea as I’d never tried it before. Cindy did the countdown, and when she shouted three and the wave was a split second before us, we made our jump. It was smiles and laughter until I could feel stabbing pain on my right knee, which made me lose balance and fell. The beach was no longer mesmerizing, times of fun were short-lived as my focus shifted to the pain. I’d injured myself quite badly since I couldn’t bear to walk. We only spent thirty minutes or so there before going back to the hotel to have my knee checked, which was disappointing as it was shorter than my first visit to Kuta beach. However, all the sneaking out at night and knee injury became the most memorable experiences of the whole trip, which I probably wouldn’t ever forget.